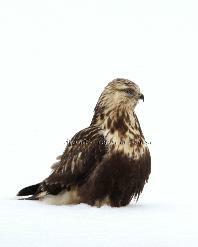 The Rough-legged Hawk aptly named for the feathers that extend down it�s leg due to it�s Northern habitat. It nests in the Artic tundra which it leaves in late fall and returns to in the early spring. Some also nest in the northern edge of the Boreal forest. In the winter it migrates down to the open field and marshes. That�s when we in Michigan are privileged to witness the Rough-legged�s beautiful flying. It hovers over an area till it spots it�s prey then dives talons first. It feeds on lemming, vole, mice and other small mammals. The photo above in the center is a dark morph adult male that the MGills were privileged to photograph while in their Eagle blind on Jim Habacso's farm. This male and a light morph female Rough-leg (similar to the female in the photo on the right) did a little talon locking but unfortunately were out of the McGills camera range. The photo on the left is a light morph male. 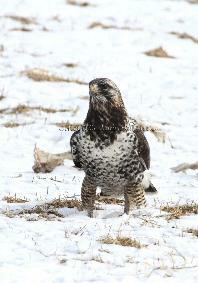 The Rough-legged Hawk also, as the McGills have witnessed, feeds on carrion especially in the winter. It nests on cliffs, large rocks or even on the ground. The female lays 3-5 eggs which incubate in thirty-one days while the male brings her food. The young fly at 5-6 weeks old but remain with the parents another 3-5 weeks. 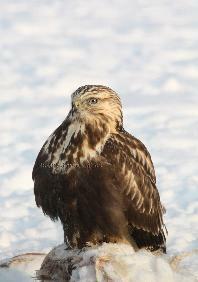 The photos above are of a juvenile Rough-legged Hawk. This little beauty visited the carrion pile many times throughout the winter. She was even brave enough to stand firm when a first year Bald Eagle decided to come and sit down beside her. But she was not as foolhardy when a 5th year male Bald Eagle came down talons first toward her(center photo). 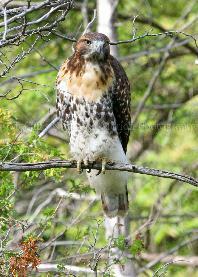 The Red-tailed Hawk is the most common hawk in North America. But it is also one of the most beautiful due to it�s namesake, the red brick color of it�s tail achieved at maturity. 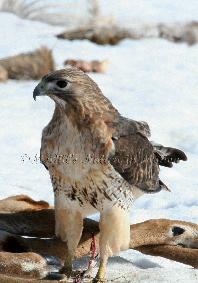 It is a great hunter preferring open fields with high perching areas for getting a wider view to watch for prey. It can frequently be seen on telephone poles, fence post etc. As with many raptors, mating season is a wonder of acrobatics. Pairs fly high with the male diving then making a steep climb back. It hooks talons with the female then they both freefall toward earth. The Red-tailed Hawk is thought to be monogamous and mate for life. The pair build their stick nest high above the ground laying 1-5 eggs that take 4-5 weeks to incubate. Both male and female share the duties of parenting. The wingspan is 3-4 feet, length of 18-26 inches and weight of 1 �-3 pounds. The photos above (right & center) are of a juvenile Red-tailed Hawk who waited and cried for it's parent to come feed it. The McGill's photograped it for over an hour. The lesson of "tough love" was being taught that day to the young Red-tailed Hawk. The McGills have also enjoyed filming these beautiful birds during their winter photo shoots with the Bald Eagles (photo on left). The Merlin Falcon is a fast agile flyer who relies on these qualities to hunt it�s prey. 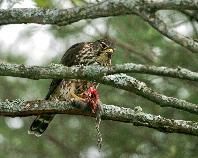 The Merlin�s prey is generally small birds but it will also take small mammals. As seen in the photo on the left. This female was filmed by the McGills in Seney National Wildlife Refuge enjoying her dinner. The Merlin is highly territorial and will challenge any other bird of prey who tries to infiltrate it�s space even a Bald Eagle. The Merlin inhabits prairies, coasts and forests throughout North America and Eurasia. The Merlin returns to a general area each year for breeding. It does not mate for life. Breeding couples will often hunt together with one �flushing� out the victim toward the other. 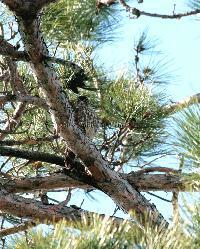 The Merlin will use abandoned nests that are found in conifer trees or build a nest on cliff faces or even the ground. The female with incubate 3-5 eggs while the male hunts for her and their young. The young hatch within 30 days and fledge within the next 30 days. The parents take care of the young up tot four weeks old. Generally three young survive per nest per year which is really quite remarkable. Even some of the first year Merlin will stay and serve as �nanny� for the next year�s brood. After breeding season the Merlin depart separately. The Merlin generally migrates to warm climates especially from the northern states such as Michigan. 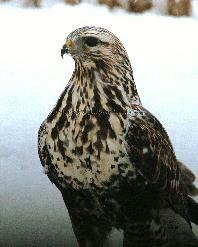 The Merlin�s chief enemies are the Peregrine Falcon, Great Horned Owl, and larger accipiter hawks. 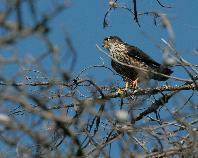 Most birds try to avoid the Merlin due to it�s aggressive nature. The male Merlin is blue on it�s back as seen in this photo on the right. Where as the female and young are brown. The male is smaller at 6 ounces with the female weighing in at 8 ounces. The length of a Merlin is 9-14 inches and the wingspan is 20-28 inches. The McGills were fortunate enough to be able to photograph and film these quick little raptors several times throughout the summer at Seney National Wildlife Refuge in the Upper Peninsula of Michigan. To learn more about Seney National Wildlife Refuge visit them at www.fws.gov/midwest/seney/index.htm. Remember they are are your Wildlife Refuges. Visit them. Support them.